If stock markets climb, this will be the eighth consecutive positive Tuesday. U.S. stock futures were flat ahead of the bell, though investors seem to be consistently upbeat on Tuesdays and market activity has been positive in recent sessions. The S&P 500 has returned around 9% year-to-date on Tuesdays, posting gains that day every week except two in 2014. However, investors are skeptical about pushing stocks too high. The CNNMoney Fear and Greed index shows investors are still feeling fearful, just days after the Dow Jones industrial average hit an all-time high. Looking to the day ahead, the Census Bureau will report the U.S. trade balance at 8:30 a.m. ET. In corporate news, drugmaker Merck (MRK) announced that it will sell its consumer care business to Bayer AG for $14.2 billion. Merck shares edged up before the open. DirecTV (DTV) shares bumped up ahead of the open after the satellite TV company reported stronger-than-expected earnings, despite a quarterly slide in net profit year over year. Office Depot (ODP) shares surged 9% in premarket trading after announcing better-than-expected earnings and plans to close 400 stores. Groupon (GRPN), Disney (DIS) and Whole Foods (WFM) will report after the close. For the rest of the week, analysts say the big movers will be testimony from Federal Reserve Chairman Janet Yellen on Wednesday, a meeting of the European Central Bank on Thursday, and ongoing tensions in Ukraine. In Europe, investors were parsing through major bank earnings from UBS (UBS) and Barclays (BCS). Shares in Barclays fell by nearly 5% in London after the British bank released worse-than-expected quarterly numbers. Shares in UBS were inching up after the Swiss bank said it would pay a special dividend. Overall, European markets were mixed in morning trading. Barclays was dragging the London FTSE 100 index down. 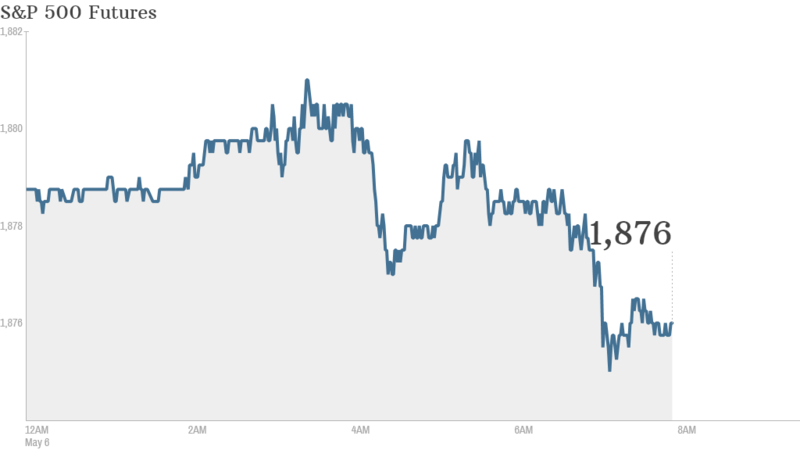 Markets in Japan, South Korea and Hong Kong were closed Tuesday. But the other Asian markets made gains. U.S. stocks closed slightly higher Monday. The Dow closed up 0.1% after dropping 120 points early in the trading session. The S&P 500 and Nasdaq also recovered from early losses, closing with a small gain.